The Ellen Ensemble, a chamber orchestra based in Cumbria, was formed early in 2016, and has given a two year series of concerts focusing on the performance of music composed by Cistercian monks or those who studied with Cistercians, and performing these works in venues with a strong Cistercian association. Concerto soloists are members of the group, and works without a Cistercian history have been included in some programmes. The Ellen Ensemble, is a group of twenty to twenty six professional and semi-professional musicians who rehearse periodically as the repertoire requires. 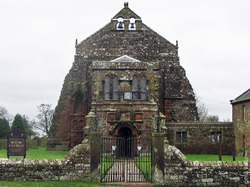 Holme Cultram Abbey, Abbeytown, Cumbria, where, on 2nd April, the orchestra gave its first concert. This beautiful former Cistercian monastery was damaged by fire a few years ago, and proceeds from the sale of tickets benefitted the enormous costs of restoration. 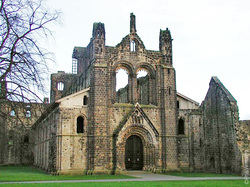 The grounds of Kirkstall Abbey, likewise a former Cistercian monastery, was the venue for the Kirkstall Festival on 9th July. The orchestra’s second concert was part of this popular festival, near Leeds. 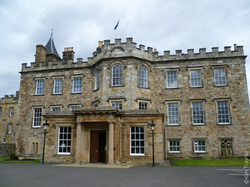 Spectacular Newbattle Abbey, near Edinburgh, was the venue for The Ellen Ensemble’s last 2016 concert on 4th December, which took place before an invited audience of members of several Edinburgh music societies. In 2017 Ellen Ensemble's mini tour of Germany saw concerts in Gernsheim on the Rhine (birthplace of Joseph Schmitt - perhaps the most famous Cistercian monk composer), and the functioning Cistercian monastery of Himmerod, in the Eifel.' The final concert of 2017 was at Whalley Abbey, former Cistercian monastery, near Clitheroe. ​The repertoire will include music composed by Jesuits or composers who studied with Jesuits. Saint Francis Xavier's is a Jesuit church. An Austrian of Italian descent, who studied with Cistercian monks at Klagenfurt. Over two hundred of his instrumental works have survived. Born near Prague and later residing in Augsburg and Mainz. He studied at the Cistercian monastery of Stams, in the Tyrol, where he left many of his manuscripts. Much of his instrumental music was written in Mainz during his tenure as director of the orchestra of the Prince-Elector. An Italian Jesuit missionary priest in Paraguay who taught music to the Guarani people. In addition to vocal church music he wrote for purely instrumental groups and is especially famed for his 'Adagio' for solo oboe, solo cello, and strings. A German, Jesuit trained priest, who also had a distinguished career as an organist, music teacher, and composer. His works include symphonies, concertos, and chamber music - and of course church music. David Shirt began conducting as a teenager – with an orchestra consisting of young musician friends. Later, he founded the Southern Youth Orchestra of ninety players, giving concerts across the south of England, from Plymouth to Littlehampton, as well as in London at the Royal Albert Hall, and the Wigmore Hall. Moving to Reading, David conducted the professional Reading Chamber Orchestra, amateur Bracknell Symphony Orchestra, and a children's group, Seer Strings, which toured several European countries, and gave a demonstration concert at the Kodaly Institute in Hungary. In London, the group played at St John’s Smith Square, and the Purcell Room at the Royal Festival Hall. David is retiring from twenty years as conductor of the West Lakeland Orchestra, and is now actively promoting Ellen Ensemble. David Shirt's musical background is as violinist and teacher, having freelanced with D'Oyly Carte Opera, Bournemouth Symphony Orchestra, Guildford Philharmonic, and The New London Chamber Orchestra. For ten years he was Head of Strings at Wellington College, Berkshire, and for twenty years Head of Strings at St Bees School, Cumbria. In addition to teaching and performing qualifications gained in his youth, David has two Master of Arts degrees, and has recently completed a PhD at Durham University.